For the San Diego Trolley station, see Barrio Logan station. Barrio Logan is a neighborhood in south central San Diego, California. 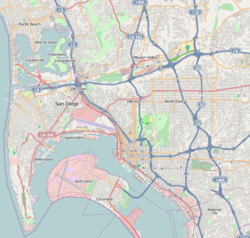 It is bordered by the neighborhoods of East Village and Logan Heights to the north, Shelltown and Southcrest to the east, San Diego Bay to the southwest, and National City to the southeast. Interstate 5 forms the northeastern boundary. The Barrio Logan Community Plan Area comprises approximately 1,000 acres, of which slightly more than half is under the jurisdiction of the Port of San Diego or the United States Navy rather than the city of San Diego. The community is subject to the California Coastal Act. When the Spanish first entered the region, they found a Kumeyaay rancheria at the mouth of Chollas Creek. The area was originally residential with access to the beach at San Diego Bay. During World War II this beach access was lost due to the expansion of Naval Station San Diego and other military facilities on the waterfront. The neighborhood continued to degrade during the 1950s and 1960s due to rezoning that permitted industrial uses, the construction of Interstate 5 through the heart of the community in 1963, and the construction of the San Diego-Coronado Bridge in 1969, which covered much of the community with a concrete "roof" supported by gray concrete pillars. The city council promised to build a community park under the bridge approaches, and a site was approved in June 1969. When construction began in April 1970 at the designated site, but the community learned that the work was intended to create a state building instead of a park, there was a nonviolent community uprising. Students and others occupied the site and forced a halt to the construction. The occupation of the site lasted twelve days. Residents planted landscaping, and a local artist, Salvador Torres, proclaimed his vision of covering the freeway support pillars with murals. After intense negotiation between the city and the state (which owned the land in question), the site was reclaimed for park use, and Chicano Park was built and dedicated. It was expanded several times and in 1990 it was extended all the way to the bay, restoring beach access to the community. The community contains many industrial areas, primarily shipbuilding and maritime uses, as well as many residences. In 2013 the neighborhood planning group drew up, and the City Council approved, a revised community plan which would have created a "buffer zone" of a commercial area separating residential uses from industrial uses. However, the ship-building industry, which objected to the buffer zone, organized and led a petition drive to overturn the plan via citywide vote. In June 2014 the voters rejected the community plan. A revised plan is in the draft stage as of 2015. Since 2015, during the same time as San Diego Comic-Con is occurring less than two miles away, there has been Chicano-Con. Barrio Logan, in southeast San Diego, is referred to as el ombligo or navel, the center of the world. Barrio Logan is the home of Chicano Park, a Chicano-themed public park created in large part by the local residents. It is located at the site of a 1970s demonstration, land takeover, and cultural renaissance for the Mexican-American community. It features more than 60 colorful murals painted on the concrete support piers for the San Diego-Coronado Bridge and Interstate 5. It was designated an official historic site by the San Diego Historical Site Board in 1980 and listed on the National Register of Historic Places in 2013. Barrio Logan is home to Naval Base San Diego, also known as 32nd Street Naval Station, as well as the NASSCO shipyard and other military-related facilities. The neighborhood is also home to artist studios and galleries and hosts periodic Art Crawl. The painting of murals in Chicano Park had been discussed as part of the total park development since 1967. Barrio Logan is part of City Council District 8 represented by Councilman David Alvarez. The Barrio Logan Community Planning Group was established in October of 2014 when City Council gave approval at the recommendation of representative Alvarez. The Barrio Logan Community Planning Area was granted status as a redevelopment area, but the state of California abolished all redevelopment areas in 2012. The area is served by the San Diego Trolley at the Barrio Logan station. ^ "Draft Barrio Logan Community Plan" (PDF). Planning Department. City of San Diego. Retrieved 31 January 2016. ^ Brian F. Smith and Associates 2011, p. 17, 20. ^ Schoenherr (29 October 2004). "Otay Valley". Sunny Chula Vista. Retrieved 2 September 2018. Erwin Gustav Gudde (1949). California Place Names: A Geographical Dictionary. University of California Press. p. 16. GGKEY:7P0ULP443T5. Mogilner, Geoffrey (Spring 2016). "Cosoy: Birthplace of New California". Journal of San Diego History. 62 (2). Retrieved 2 September 2018. ^ "Community Profiles Barrio Logan | City of San Diego Official Website". Sandiego.gov. Retrieved 2016-11-12. ^ "Chicano Park". Chicanoparksandiego.com. Retrieved 2016-11-12. ^ Keatts, Andrew (September 16, 2013). "Everything You Need to Know About the Barrio Logan Community Plan". Voice of San Diego. Retrieved 31 January 2016. ^ "San Diego Voters Reject Barrio Logan Community Plan". KPBS. June 4, 2014. Retrieved 31 January 2016. ^ Bowler, Matthew (9 July 2015). "Barrio Logan Wants In On Comic-Con Spotlight". KPBS. San Diego. Retrieved 5 September 2018. Zaragoza, Alex (16 July 2015). "Chicano-Con Is San Diego's Latino-Focused Comic-Con". KCET. Burbank. Retrieved 5 September 2018. Valenzuela, Beatriz E. (21 July 2018). "Comic-Con meet Chicano-Con, which brings comics, artists together at Barrio Logan brewery". San Bernardino Sun. Retrieved 5 September 2018 – via OC Registrar. ^ "The new North Park". The San Diego Union-Tribune. Retrieved 2016-03-30. ^ "Home". Barrio Art Crawl. Retrieved 2016-03-30. Wikimedia Commons has media related to Barrio Logan, San Diego. Brian F. Smith and Associates; Brian F. Smith; Melanie D. Lytle; Larry J, Pierson; Sara Clowery-Moreno; Tracy Stropes; Andrew Hoge; Ms. Ltyle; Mr. Smith; Matthew Smith (1 February 2011). Barrio Logan Historical Resources Survey (PDF) (Report). Dylan Amerine, Nora Thornbury, Adrian Moreno, and Jenni Kraft. City of San Diego City Planning & Community Investment. This page was last edited on 3 January 2019, at 04:46 (UTC).